1Departments of Anesthesia, School of Medicine, Stanford University, Stanford, USA; 2Cardiothoracic Surgery, School of Medicine, Stanford University, Stanford, USA. Acute postoperative respiratory distress may be caused by pneumonia, pulmonary embolism, heart failure, pneumothorax or atelectasis. We present s case report of a 78-year-old female patient who developed acute respiratory distress one day following knee arthroscopy. Because of the suspicion of pulmonary embolism, a computed tomographic angiography was made, showing the presence of an unexpected large left atrial mass, suggestive for a myxoma. 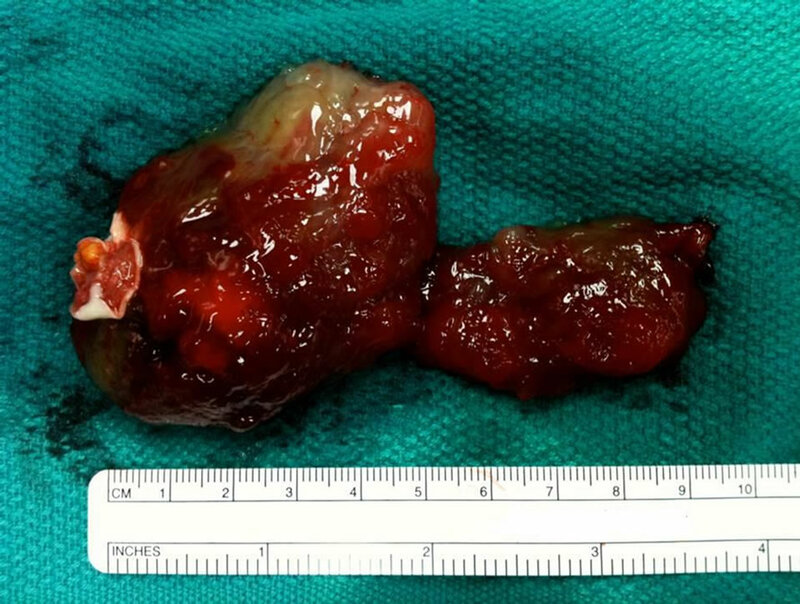 She underwent successful resection of a 10 × 5 cm myxoma one week later. The report discusses the clinical manifestations of an atrial myxoma and its potentially fast growth. Bedside echocardiography should be considered the preferred diagnostic modality in case of acute postoperative respiratory distress. Acute postoperative respiratory distress following noncardiac surgery can be a serious adverse event, and is most often caused by pneumonia, pulmonary embolus, pneumothorax, atelectasis and heart failure . In this brief report we present a case of acute postoperative pulmonary edema due to an unsuspected, previously asymptomatic, large left atrial myxoma. A 78-year-old woman with a history of hypertension, osteoarthritis, and a recent diagnosis of asthma underwent total knee arthroscopy under general anesthesia. Cardiac history was otherwise negative. On postoperative day one, she developed acute shortness of breath, tachypnea, and cough. Workup included a chest x-ray demonstrating bilateral pleural effusions, and a normal ECG. In concern for pulmonary embolism, computer tomographic angiography (CTA) was performed, which was negative for pulmonary embolism, but significant for a large left atrial mass. Subsequent transthoracic echocardiography demonstrated a mobile mass measuring 6 × 3 cm, with an attachment to the interatrial septum, consistent with left atrial myxoma. Of note, the patient underwent a CT chest eight months earlier for symptoms of fatigue and intermittent cough. No significant abnormalities were observed, and she was subsequently treated for asthma. On postoperative day seven, after successful treatment of pulmonary edema, the patient underwent a left atrial myxoma resection on cardiopulmonary bypass. 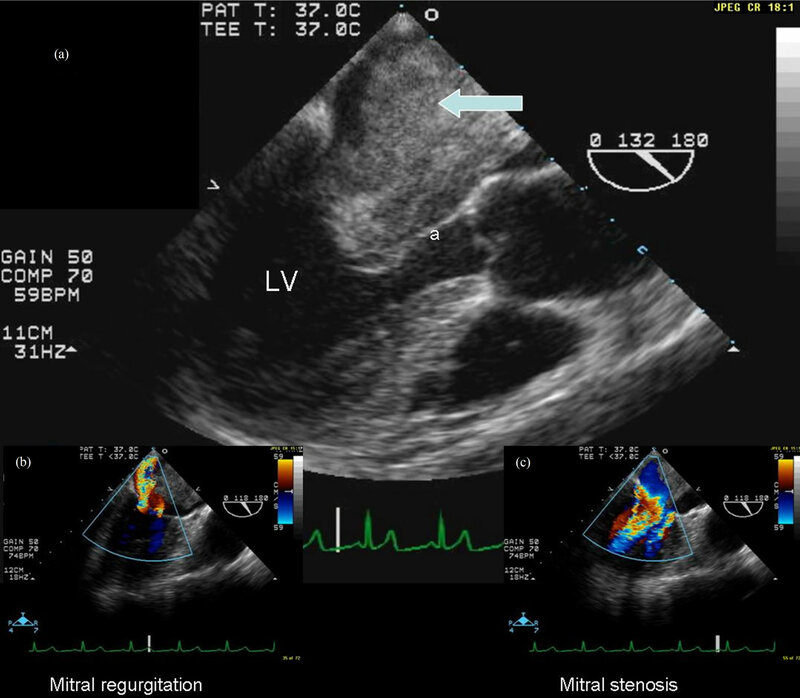 Intraoperative transesophageal echocardiography (TEE) demonstrated a large mobile left atrial mass, with a septal attachment near the mitral valve, causing mitral valve obstruction and moderate to severe mitral regurgitation (Figure 1). The left atrial mass was resected via a right atrial transseptal approach, measured 10 × 5 cm (Figure 2), and was diagnosed on pathologic specimen as an atrial myxoma. TEE after mass resection demonstrated that all signs of mitral stenosis were alleviated, with a residual mild mitral regurgitation. Apart from developing episodes of hemodynamically stable atrial fibrillation, the patient’s postoperative course was uneventful, and she was discharged on postoperative day 7. Figure 1. Intraoperative Transesophageal Echocardiography (long-axis view), showing: (a) large left atrial myxoma (arrow), obstructing inflow through the mitral valve annulus during diastole (a = anterior leaflet of mitral valve). LV = left ventricle; (b) Myxoma causing mitral regurgitation; (c) Myxoma causing mitral stenosis. edema, and pulmonary hypertension. Left atrial enlargement may lead to atrial arrhythmias, thrombus formation, and embolism. More systemic symptoms like fever, arthralgia, fatigue and weight-loss are described as well. As many as 4% of patients remain asymptomatic . Atrial myxomas may grow quite rapidly, with a reported growth rates of average 0.49 cm/month . Our patient had no detectable mass by CT only eight months earlier. Myxomas cause mitral stenosis by obstructing the mitral valve during diastole. While the pathophysiology is distinct from mitral stenosis caused by rheumatic disease, the mitral stenosis may be as severe, and the clinical consequences are the same. Furthermore, acute obstruction of the mitral valve caused by a very large myxoma may lead to cardiovascular collapse that cannot be relieved without surgical intervention. Mitral regurgitation often coexists, and may result from damage to the mitral valve leaflets by the mass, most often the anterior leaflet, or from annular dilation. This may require annuloplasty after myxoma resection . Figure 2. Specimen: left atrial myxoma with atrial septal attachment, measuring 6 × 3 cm on imaging. On resection, true size was 10 × 5 cm. Reviewing her postoperative diagnostic workup also highlights the value of transthoracic echocardiography as a quick, non-invasive tool in the evaluation of postoperative respiratory distress. The most likely order of common causes of acute respiratory distress following noncardiac surgery includes pulmonary embolism, pneumonia, pneumothorax, atelectasis-induced hypoxemia and heart failure. Diagnostic imaging tools like CT scan and magnetic resonance imaging (MRI) require moving a potentially unstable patient, and at times administering contrast. In the described case, a bedside echocardiogram would have immediately shown the underlying cause of the patient’s distress, and the need for surgical intervention would have been established. In conclusion, we suggest left atrial myxoma be included in the differential diagnosis of acute postoperative respiratory distress following non-cardiac surgery. We propose that echocardiography should be the first choice of imaging in these conditions.